Yes, we are gearing up for the holidays here at Gingiber. May I introduce to you my newest holiday buddy, "Reluctant Santa". 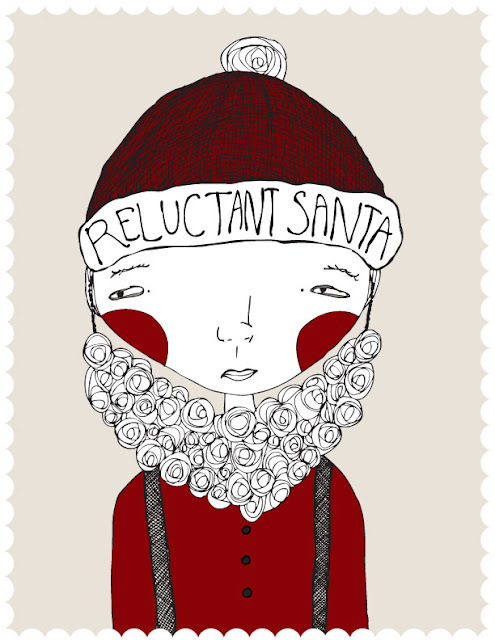 He is the first of a cute trio of illustrations for the holidays. As you can tell, this santa is a bit reluctant for the holiday season to begin. His yearly gig at the local mall is around the corner, but he has lost a considerable amount of weight in the past year. His costume does not seem to fit! I would be reluctant too! Don't worry, Santa. the kids will not even notice your new trim figure! I will be offering him as a greeting card, as well as a fun print.